Late last year I savoured the final, dramatic episodes of Hannibal (2013-15), a series for which I have come to have an increasingly strong appreciation. The artistry inherent in so many aspects of its production—in writing, cinematography, direction, performance, and music—is supreme, such that I’m still baffled as to how few awards or even nominations the series garnered during its three-season run. This was a series of which it can truly be said that it pushed the boundaries of what television—and not just U.S. network television, on which it aired—could portray. Based upon characters in Thomas Harris‘s novel Red Dragon (1981) and alongside a frequently baroque predilection for violence and gore, it explored the relationship between a single criminal profiler/patient, Will Graham (Hugh Dancy), and a serial killer/psychiatrist, Hannibal Lecter (Mads Mikkelsen), to unparalleled extremes. 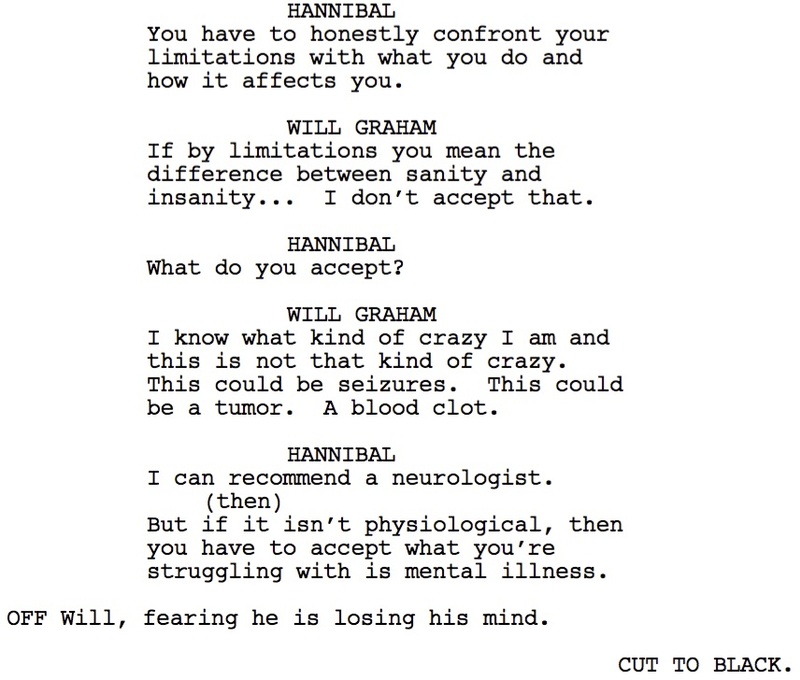 Diverting from Harris’s original novel, Hannibal positions Lecter as the appointed supervisor to Will Graham’s mental wellbeing at the instruction of Jack Crawford (Laurence Fishburne), head of the (now defunct in reality) Behavioral Science Unit at the F.B.I.. Unbeknownst to either Graham or Crawford, however, the very man to whom the celebrated forensic profiler’s care has been entrusted is a shrewd, cannibalistic serial killer. 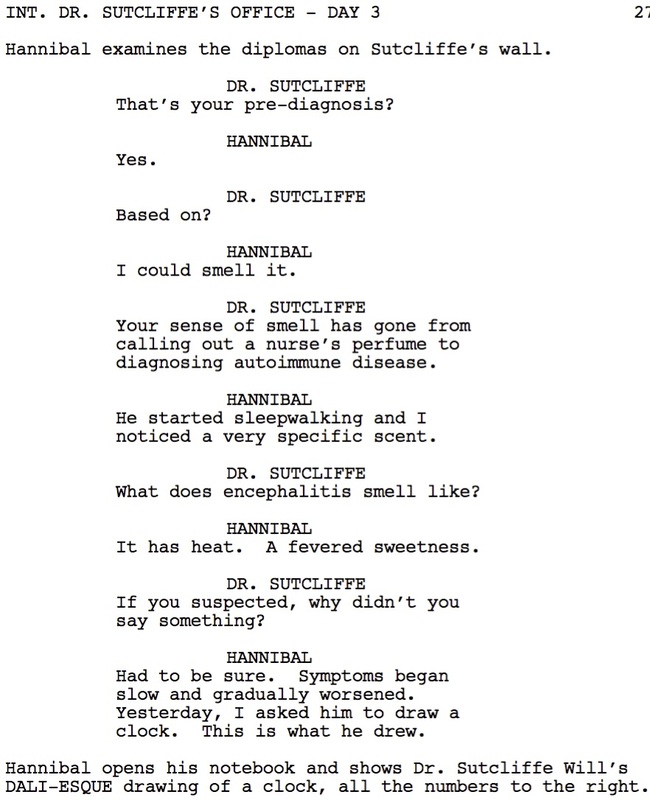 Fascinated by Will’s empathic ability to visualise the crimes he investigates, Lecter seeks to turn the profiler into the very predator he seeks, thus creating a proxy for the crimes he commits in order to satisfy his cruel appetites, even as the pair form a close bond and a mutual respect for one another. It is an arc that significantly changes the set-up of the novel from which the series is derived but, in so doing, sets up a fascinating dynamic between the pair. How, then, does such a singular creation handle its presentation of mental health? In terms of an episode that I thought would fit well with this blog—at least for its first appearance—we need to go all the way back to one of the latter instalments from the series’ first year. “Buffet Froid” marks a further escalation in the season’s ongoing focus upon this extraordinary psychological manipulation of Graham by Lecter. Will has been suffering periods of lost time, mental instability, and violent hallucinations during the course of his work, and Dr. Lecter has been seeking to convince him that he is becoming disengaged from reality. Will is correct in his assertion that he is physically ill; he has encephalitis, an inflammation of the brain with a range of symptoms that include those from which he is suffering. But it suits Hannibal’s purpose to guide his ward away from such convictions, and instead to convince him he is mentally fragile in such a way as to create that very fragility. Indeed, such considerations go towards potential explanations for Will Graham’s almost supernatural powers. 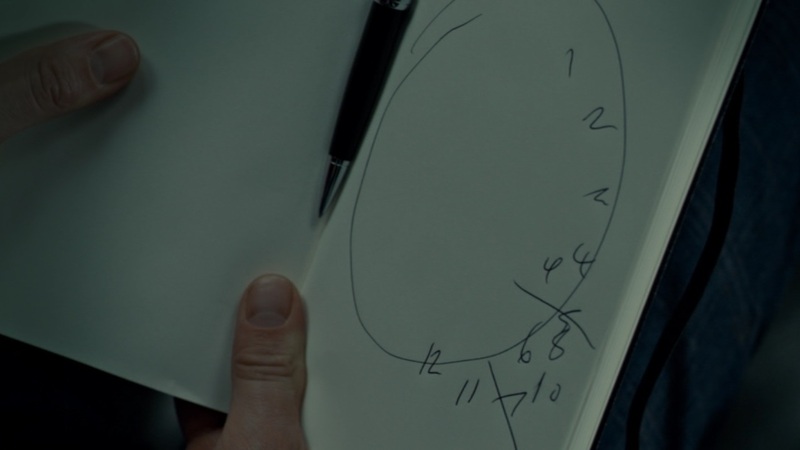 The filmic device used by the series envisions the profiler internally turning back the clock and acting out the murders when at a crime scene, which Crawford describes to Lecter in this episode as “a mild form of echopraxia“, a condition which invokes the involuntary repetition of someone else’s actions and has been linked to to the autistic spectrum and schizophrenia. 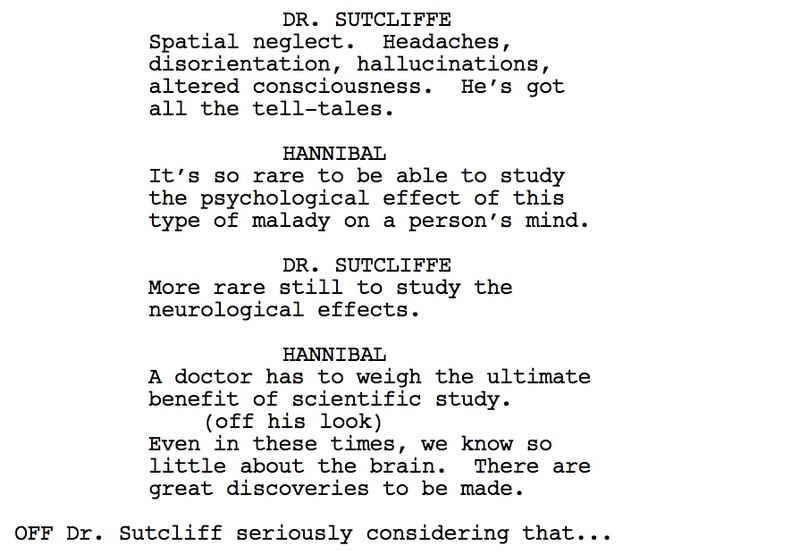 Hannibal refutes the suggestion, suggesting instead that Will “doesn’t just reflect, he absorbs” during this process as a result of having “too many neurons” in his brain. [He] really struck such a fantastic aesthetic for this show that is all about the contrast between lightness and dark. And if we are carrying that principle through to how Mads Mikkelsen always approached the character [of Hannibal Lecter], which is not of a cannibal psychiatrist but actually of Lucifer himself, the fallen angel who was smitten with humanity and mankind and fell for them, and is now drawn to a very pure man in Will Graham. So that mythology is always one that, ever since Mads suggested it, I can’t get it out of my head. And in my mind that is the reality of this show, which is that it is a parable of good and evil. In pure storytelling terms, Hannibal is a fascinatingly multi-layered creation with strongly-defined themes. 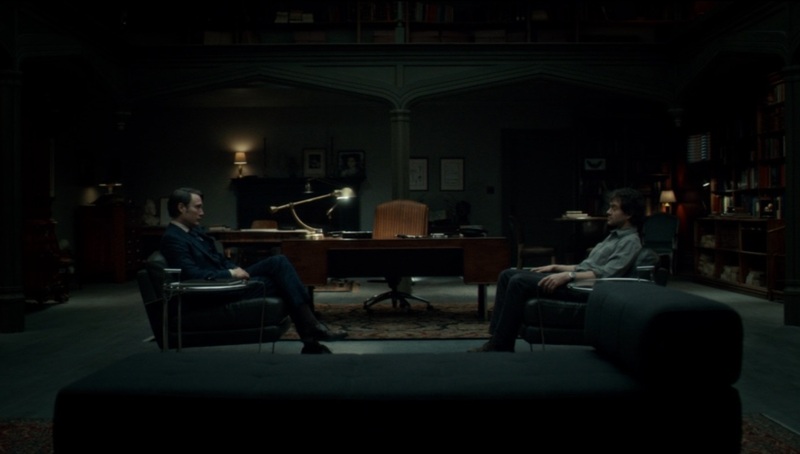 Even as Will Graham seeks to rebuild the story leading up to the crime scenes he explores by reliving them as a mental construct, so does Hannibal act to manipulate Will’s personal narrative. Furthermore, the case-of-the-week killer in “Buffet Froid” is a disturbed young woman with Cotard’s Syndrome, a delusional state in which the sufferer believes they are dead, and which is coupled with an inability to recognise faces (a facet of the condition that becomes crucial to the plot). With an array of mental illnesses offered in this instalment alone, the lines between objective truth and distorted perceptions—both of the self and of others—start to blur. The complexity with which it wields its armoury, not least in its heady mix of obscure conditions, does also have a tendency to leave Hannibal feeling at times somewhat over-engineered, and notably so in this instalment. It is, however, never less than compelling. The series is also less concerned with hyper-reality than it is in its heavily-stylised exploration of the aforementioned central characters’ dynamic. If the tension as to whether or not Will Graham truly might become the very kind of killer he seeks—with Nietzsche‘s oft-quoted maxim that “He who fights with monsters should be careful lest he thereby become a monster“—feels an unlikely outcome in the context of a long-form series of this nature, then any prospective but as yet uninitiated viewer should consider that Hannibal sets out to play the long game in this regard as the events of all three seasons gradually unfold. Ultimately, what Hannibal presents the viewer is an intricately-constructed narrative that requires and—due to its high production standards and, in particular, through the compelling performance of its leads—demands the viewer’s full attention. It is those central performances that also ground the content with a sense of believability in spite of itself. The television landscape feels poorer for its absence, not just for its striking visuals and strong production values at every level, but also for its uncommonly detailed considerations of psychiatry and mental illness as key components in the eternal struggle between good and evil embodied in its vivid characterisations of Will Graham and Hannibal Lecter.